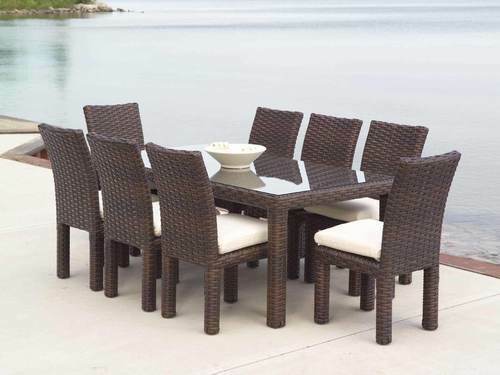 We are paramount in offering a wide range of Wicker Dining Table. Our products are crafted in compliance with both the industrial norms as well as exact requirements of the valuable patrons. These products are manufactured to fulfill the exact demands & requirements of clients. Although a recent entrant in the industry, our organization "Global Corporation" has emerged as one of the largest supplying, trading, distributing and wholesaling of imported furniture fulfilling the needs of Home and Office Furniture. Our range of furniture consists of Office Furniture, Outdoor Furniture, Hotel Furniture, Restaurant furnitures, and Residential Furniture of various types. These furniture are made of finest quality raw material such as hardwood, softwood, veneers, and iron, which ensure durability. Clients prefer our supplied furniture due to their varied designs, styles, functionality, and comfort factor. We offer Home & Office Furniture like outdoor furniture, office furniture, hotel furniture, residential furniture, lounge chairs, bedroom set. The furniture we import from our vendors are high on quality and style. These furniture are designed in both contemporary and traditional styles to appease the preferences of all our clients. Apart from being aesthetically appealing, these furniture are also highly functional. Perfect for all types of interior and exterior decors, our supplied furniture are available in various options in terms of size, style, design, colors and surface finish. Every furniture is thoroughly checked for its quality, finish and texture to be sure that there are no defects or flaws. Our organization caters to clients located all over the Indian subcontinent. This is being possible due to our wide distribution networks and an efficient logistics unit.